Controlling chronic immunoinflammatory diseases such as lesions in the eye caused by infection with HSV represents a therapeutic challenge. Since CD4+ T cells are the primary orchestrators of lesions, targeting activated CD4+ T cell subsets and increasing the representation of cells that express regulatory function would be a logical therapeutic approach. We show that this outcome can be achieved by therapy, systemic or local, with the lectin family member galectin-9. This molecule, which is a natural product of many cell types, acts as a ligand to the inhibitory molecule TIM-3 (T cell Ig and mucin-3) that is expressed by activated but not naive T cells. We show that 50% or more of T cells in ocular lesions caused by HSV in mice express TIM-3 and that blocking signals from its natural ligand with a mAb results in more severe lesions. More importantly, the provision of additional galectin-9, either systemically or more effectively by local subconjuctival administration, diminished the severity of stromal keratitis lesions as well as the extent of corneal neovascularization. Multiple mechanisms were involved in inhibitory effects. These included apoptosis of the orchestrating effector T cells with consequent reduction of proinflammatory cytokines and an increase in the representation of two separate subtypes of regulatory cells as well as inhibitory effects on the production of molecules involved in neovascularization, an essential component of stromal keratitis pathogenesis. Our results indicate that galectin-9 therapy may represent a useful approach to control HSV-induced lesions, the most common cause of infectious blindness in the Western world. One of the dire consequences of HSV infection is blindness resulting from infection in the eye and a subsequent chronic inflammatory reaction in the corneal stroma. This lesion is considered to be immunopathologically orchestrated by T lymphocytes that recognize peptides derived from viral proteins or perhaps from altered self proteins of the damaged cornea (1, 2). Currently, herpetic stromal keratitis (HSK)3 is mainly controlled by combinations of drugs that include antivirals and steroids, with the latter being administered for prolonged periods of time (3). Future therapies are expected to emerge from a better understanding of the disease pathogenesis so that critical steps can be counteracted more precisely. Identifying such steps has come mainly from studies in animal models, especially the mouse, where lesions that closely resemble those in humans can routinely be induced following primary infection with appropriate strains of virus (4). Such studies have revealed a critical role of CD4+ T cells of the Th1 subset as mediators of lesions (5, 6). As a consequence, either preventing the access of Th1 cells to the eye or blunting their activity once at ocular sites represents a potentially valuable form of therapy. Recent studies on some autoimmune lesions caused by pathogenic T cells have indicated that one means of terminating the activity of such T cells is to engage receptors expressed by activated cells that deliver an inhibitory or lethal signal to the cell (7, 8, 9, 10, 11). This effect was achieved in some situations by engaging the TIM-3 (T cell Ig and mucin-3) receptor, a member of the T cell Ig and mucin family of proteins, with its recently identified ligand galectin-9 (8). Accordingly, the resolution of autoimmune lesions in collagen arthritis (a CD4+ Th1 subset-mediated autoimmune lesion) occurred following treatment with galectin-9 (12). Some measure of control was also achieved with galectin-9 treatment in other immunoinflammatory lesions such as experimental autoimmune encephalomyelitis and graft-vs-host disease (8, 13, 14). To our knowledge, a role for TIM-3/galectin-9 interaction in controlling inflammatory lesions caused by microbial agents has yet to be explored. The present studies were designed, therefore, to evaluate if lesions in the eye caused by HSV were subject to control by manipulating the TIM-3/galectin-9 system on one or more cell types involved in causing HSK. Our studies demonstrate that galectin-9 and TIM-3 interaction does influence the expression of lesions in the eye following ocular infection with HSV. Accordingly, lesions were significantly more severe if the signals delivered to TIM-3 were interrupted using anti-TIM-3 Ab. Moreover, if galectin-9 was supplied in excess, either by systemic or local administration, lesion severity, which included particularly the extent of ocular neovascularization, was diminished. The mechanisms by which galectin-9 acted in vivo were likely multiple. These included induction of apoptosis of pathogenic effector Th1 cells, induction or the expansion of two types of regulatory cells, as well as the diminished production of some factors involved in corneal neovascularization. Influencing the function of the TIM-3/galectin-9 pathway holds promise as a means to control the severity of HSK lesions. Female 6- to 8-wk-old C57BL/6 mice were purchased from Harlan Sprague Dawley. GFP-Foxp3 knockin mice were a kind gift from Dr. M. Oukka (Brigham and Women’s Hospital, Harvard Medical School). All animals were housed in the animal facilities at the University of Tennessee. BALB/c DO11.10 RAG2−/− mice were purchased from Taconic and kept in our specific pathogen-free facility where food, water, bedding, and instruments were autoclaved. All manipulations were done in a laminar flow hood. All experimental procedures were in complete agreement with the Association for Research in Vision and Ophthalmology resolution on the use of animals in research. HSV-1 RE Tumpey and HSV-1 RE Hendricks were propagated and titrated on Vero cells (American Type Culture Collection CCL81) using standard protocols. The virus was stored in aliquots at −80°C until use. CD4-allophycocyanin (RM4-5), DO11.10-PE (KJ1.26), CD25-FITC (7D4), CD103-FITC (M290), CD62L-allophycocyanin (MEL-14), CD44-FITC (1M7), Foxp3-PE (FJK-16s), Foxp3-FITC (FJK-16s), CD69-FITC (H1.2F3), CD11c-PE (HL3), CD11c-allophycocyanin (HL3), anti-IFN-γ-FITC, anti-IL-17-PE, CD11b-PerCP (M1/70), Gr1-PE (RB6-8C5), Gr1-FITC (RB6-8C5), F4/80-FITC (BM8), Ly6C-FITC (AL-21), anti-CD3 (145.2C11), and anti-CD28 mAb (37.51) were purchased from BD Pharmingen (San Diego, CA). Anti-TIM-3-allophycocyanin (catalog no. FAB1529A), anti-TIM-3-PE (catalog no. FAB1529P), recombinant IL-6, and recombinant human TGF-β1 were obtained from R&D Systems. Anti-TIM-3 mAb (RMT3-23) and rat IgG2a isotype control Ab (2A3) was obtained from Bio-X-cell. Mouse and human recombinant galectin-9 was provided by Gal Pharma. Galectin-3 was obtained from Sigma-Aldrich. Recombinant human IL-2 and OVA323–339 peptide were obtained from Hemagen and GenScript, respectively. CFSE was obtained from Molecular Probes and was used at a final concentration of 0.5 μM for 15 min at 37°C in PBS. Complete RPMI 1640 was used for in vitro cultures. Corneal infections of C57BL/6 mice were conducted under deep anesthesia. Mice were scarified on their corneas with a 27-gauge needle, and a 3-μl drop containing the required viral dose was applied to the eye. The eyes were examined on different days postinfection (dpi) with a slit-lamp biomicroscope (Kowa), and the clinical severity of keratitis and angiogenesis of individually scored mice was recorded as described elsewhere (15, 16). Six- to 8-wk-old C57BL/6 mice were ocularly infected under deep anesthesia with either 5 × 105 PFU of HSV-1 RE Hendricks or 5 × 103 PFU of HSV-1 RE Tumpey and divided randomly into groups. One group of animals infected with HSV-1 RE Hendricks was administered with 100 μg of anti-TIM-3 Ab i.p. every alternate day starting from day 3 until day 13 postinfection. Animals in the control group were given isotype control Ab following the same regimen. Animals infected with HSV-1 RE Tumpey were given galectin-9 (10, 50, or 100 μg) i.p. starting from day 3 until day 13 daily while control animals received diluent. In some experiments, 6–8 μl of galectin-9 (1, 5, or 10 μg) was injected subconjuctivally into the eye daily starting either from day 4 or from day 8 until day 13. Galectin-9 was concentrated using Amicon ultracentrifuge devices (Millipore). Tubes were treated with N/10 NaOH and washed with sterile PBS before using. Mice were observed for the development and progression of HSK lesions and angiogenesis from day 5 until day 14, as described elsewhere (15, 16). Most of the experiments were repeated at least three times unless stated otherwise. Splenocytes isolated from DO11.10 Rag2−/− mice were used as the precursor population for induction of Foxp3 in CD4+ T cells as described elsewhere (17). Briefly, 2 × 106 of total splenocytes after RBC lysis and several washings were cultured in 1-ml volume with previously optimized doses of plate-bound anti-CD3 Ab (0.125 μg/ml in 200-μl volume), rIL-2 (25–100 U/ml), and TGF-β (2.5–10 ng/ml) for 5 days at 37°C in a 5% CO2 incubator in 48-well plates. In some cultures in addition to IL-2, TGF-β either alone or in combination with various concentrations of galectin-9 was added. After 5 days, cells were characterized phenotypically by flow cytometry. For the differentiation of CD4+ T cells into Th17 cells, splenocytes isolated from DO11.10 Rag2−/− mice were cultured with 10 μg/ml OVA323–339 peptide, TGF-β (2.5–10 ng/ml), IL-2 (25 U), and IL-6 (30–60 ng/ml) for 5 days. To look for the effect of galectin-9 on Th17 cells, various concentration of galectin-9 or galectin-3 were added into cultures at the beginning. After 5 days, cells were analyzed by intracellular cytokine staining for the production of IL-17 and IFN-γ using a BD Biosciences kit. Foxp3 intranuclear staining was done using a kit from eBioscience. Splenocytes and draining lymph node (DLN) cells isolated from control and galectin-9-treated HSV-infected animals 14 dpi were labeled with 0.5 μM CFSE at 37°C for 10 min. Labeled cells (5 × 105) were cultured in the presence of IL-2 (100 U/ml), anti-CD3 (1 μg/ml), and anti-CD28 (1 μg/ml) mAb for 3 days. After 3 days of incubation, dilution of CFSE was analyzed in stained Foxp3− and Foxp3+ CD4+ T cells. DLN cells and splenocytes isolated from uninfected and HSV-infected C57BL/6 mice at 8 dpi were incubated with various concentrations of galectin-9 and galectin-3 for 8 h in 96-well flat-bottom plates in humidified incubators in presence of 5% CO2. After the incubation period was over, cells were stained for annexin V using a kit from BD Biosciences. Additionally, cells were also costained for TIM-3 and annexin V. Stained cells were analyzed immediately by flow cytometry. A mouse stromal fibroblast cell line (MK/T-1) kindly gifted by Dr. Winston Kao (Department of Ophthalmology, University of Cincinnati, Cincinnati, OH) was used for studying the effect of galectin-9 on VEGF production. The cells were cultured in 10% DMEM and plated onto 24-well tissue culture plates. The cells at >90% confluency were infected with 5 multiplicity of infection (MOI) of HSV-KOS for 1 h. Thereafter, galectin-9 was added into the cells at various concentrations. Untreated but infected cells served as a positive control for these experiments. In initial experiments cells were harvested at different times and stored in RNA stabilizing solution obtained from Qiagen. For most of the subsequent experiments cells were harvested after 12 h.
RNA was extracted from the cells stored in RNA later using an RNeasy Mini kit (Qiagen). Total cDNA was made with 1 μg of RNA using oligo(dT) primer. Real-time PCR was performed using SYBR Green PCR Master Mix with iQ5 real-time PCR detection system (Bio-Rad). VEGF expression levels of samples were normalized to hypoxanthine phosphoribosyltransferase (HPRT) using ΔCt calculations. Relative VEGF expression between control and experimental groups were calculated using the 2−ΔΔCt formula. The sequences of the primers were: VEGF 5′-ACACAGGACCGCTTGAAGAT-3′ and 5′-CTGCACCCACGACAGAAG-3′, and HPRT 5′-GACCGGTCCCGTCATGC-3′ and 5′-TCATAACCTGGTTC ATCATCGC-3′. The corneal samples were pooled groupwise and homogenized using a tissue homogenizer (Pellet Pestle mortar; Kontes). The concentrations of various cytokines and VEGF was measured by sandwich ELISA kits from eBioscience (IL-6), BD Biosciences (IL-12, TGF-β), and Quantikine (VEGF-A). For TGF-β quantitation, samples were first acidified as per the manufacturer’s instructions. Single-cell suspensions were prepared from the cornea, draining cervical lymph nodes (DLNs), and spleen of mice at different time points postinfection. Corneas and trigeminal ganglia were excised, pooled groupwise, and digested with 60 U/ml Liberase (Roche Diagnostics) for 60 min at 37°C in a humidified atmosphere of 5% CO2 as described earlier (17, 18). After incubation, the corneas and trigeminal ganglia were disrupted by grinding with a syringe plunger on a cell strainer and a single-cell suspension was made in complete RPMI 1640 medium. The single-cell suspension obtained from lymph nodes, spleen, and corneal samples were stained for different cell surface molecules for FACS. All steps were performed at 4°C. Briefly, a total of 1 × 106 cells was first blocked with an unconjugated anti-CD32/CD16 mAb for 30 min in FACS buffer. After washing with FACS buffer, fluorochrome-labeled respective Abs were added for 30 min. Finally, the cells were washed three times and resuspended in 1% paraformaldehyde. To enumerate the number of IFN-γ- and TNF-α-producing T cells, intracellular cytokine staining was performed as previously described (18). In brief, 106 freshly isolated splenocytes and lymph node cells were cultured in U-bottom 96-well plates. Cells were left untreated or stimulated with 2 MOI of UV-inactivated HSV-1 and incubated overnight at 37°C in 5% CO2. Brefeldin A (10 μg/ml) was added for the last 5 h of the culture period. After this period, cell surface staining was performed, followed by intracellular cytokine staining using a Cytofix/Cytoperm kit (BD Pharmingen) in accordance with the manufacturer’s recommendations. The Abs used were anti-IFN-γ-PE and anti-TNF-α-FITC. The fixed cells were resuspended in 1% paraformaldehyde. For in vitro-induced cultures, cells were stimulated with PMA (50 ng) and ionomycin (500 ng) for 5 h in the presence of brefeldin A (10 μg/ml). Subsequently, cells were first stained as described above for surface CD4 and intracellular cytokines (IL-17 or IFN-γ). The stained samples were acquired with a FACSCalibur (BD Biosciences) and the data were analyzed using the FlowJo software. Most of the analyses for determining the level of significance were performed using Student’s t test. Values of p ≤ 0.001 (∗∗∗), p ≤ 0.01 (∗∗), and p ≤ 0.05 (∗) were considered significant. Results are expressed as means ± SD. For some experiments, as mentioned in the figure legends, a one-way ANOVA test was applied. As a prelude to exploring the value of manipulating TIM-3/galectin-9 interaction to influence the outcome of stromal keratitis (SK), mice were ocularly infected with HSV and the expression pattern of TIM-3 on CD4+ T cells was measured at various times in lymphoid tissues, as well as the eye and trigeminal ganglion. Naive animals lack inflammatory cells in the corneal stroma but invasion by many cell types, including CD4+ T cells, is fully evident by day 8 postinfection. At this time, replicating virus is usually cleared, although the extent of the ocular inflammatory response usually continues to progress and peaks in severity between 15 and 21 days (5). Spontaneous regression, especially to a fully resolved state, usually does not occur without treatment. The results in Fig. 1⇓, A and D, record the frequency and numbers of CD4+TIM-3+ T cells in the DLNs and spleens at various times after HSV infection. In naive animals, few CD4+ T cells expressed TIM-3 (between 0.5% and 3.0% in different experiments) and many that do were Foxp3+ (∼30% of CD4+TIM-3+) (Fig. 1⇓C). By day 8, significant increases in the frequencies of TIM-3+CD4+ T cells were evident in both lymph nodes and spleen. The pattern was similar on day 15, but by day 40 had declined markedly. Analysis of lymph node and spleen cells at the time of peak responses revealed that most of the TIM-3+CD4+ T cells expressed the activation marker CD44high (Fig. 1⇓B). Although we lack the reagents to prove it, we suspect that the increased populations of TIM-3+CD4+ T cells were HSV-specific cells. Kinetic analysis of TIM-3 expression on CD4+ T cells after ocular HSV infection. C57BL/6 mice were infected with 5 × 103 PFU of HSV. Three animals were sacrificed at each indicated time point and their spleens and draining cervical lymph node cells were analyzed for surface expression of CD4 and TIM-3 by flow cytometry. A, Histogram showing the percentage of CD4+TIM-3+ T cells in spleen and DLN at indicated time points is shown. Data are shown from one representative experiment. B, Dot plot shows the expression of TIM-3 on CD4+CD44high T cells CD4+ gated. C, The expression of TIM-3 on CD4+Foxp3-GFP+ and CD4+Foxp3-GFP− from DLN of uninfected and HSV infected animals at 8 dpi. D, Absolute numbers of TIM-3+CD4+ T cells in spleen and DLNs at indicated time points are shown. E, The expression of TIM-3 on CD4+ T cells isolated from inflamed pooled corneas and trigeminal ganglia at day 8 and day 15 postinfection is shown. All kinetic experiments were repeated at least twice. Ocular as well as trigeminal ganglion samples were also analyzed using tissue pools from several animals after collagenase digestion (Fig. 1⇑E). At both time points examined, ∼50% of CD4+ T cells were TIM-3+. Taken together, these results demonstrate that TIM-3 is up-regulated on CD4+ T cells following HSV infection. This was especially evident at the inflammatory ocular and trigeminal ganglia sites. Studies on autoinflammatory lesions have indicated that TIM-3 signaling may represent a mechanism by which lesions are regulated under physiological conditions (8, 11, 19). The results expressed in Fig. 2⇓, A and B, indicate that a similar situation likely occurs with HSV-induced ocular lesions. This was shown by comparing the outcome of ocular infection in mice given a TIM-3 blocking mAb with those that received an isotype control mAb. Treatment was begun 3 days postinfection and the severity of HSK, as well as the extent of neovascularization, was compared over a 15-day observation period. The results were clear-cut and supported the notion that blocking TIM-3 led to enhanced HSV lesions and increased levels of neovascularization (Fig. 2⇓, A and B). In two separate experiments involving 14 eyes, positive SK lesions (scores of ≥2) were evident earlier in mice that received anti-TIM-3 (8 of 14 eyes positive at day 7) than those given the isotype control Ab (0 of 14 eyes at day 7). Lesions also became significantly more severe in anti-TIM-3 recipients, with a higher percentage of eyes showing positive lesions overall (12 of 14 with scores of ≥2 and 10 of 14 with a score of ≥3) compared with isotype control Ab recipients (2 of 14 with scores of ≥3) at day 14. A similar pattern of events was noted with the neovascularization scores. 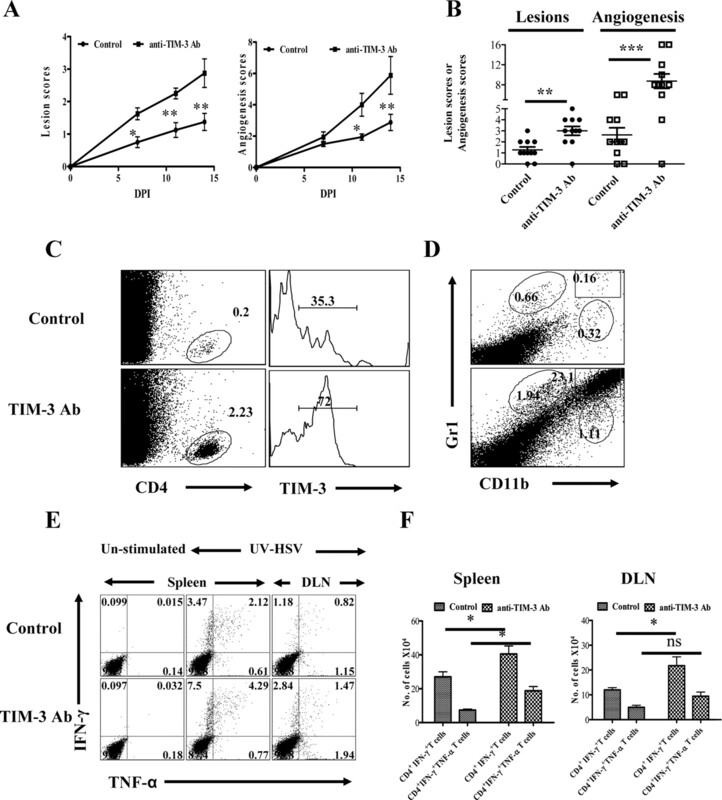 Effects of TIM-3 blockade on corneal inflammation and HSV-specific CD4+ T cell immune response. C57BL/6 animals infected with 5 × 105 PFU of HSV were given either anti-TIM-3 mAb or isotype control Ab every alternate day starting from day 3 until day 13. The disease progression and immune parameters at day 14 were analyzed. A, The SK lesion severity and magnitude of angiogenesis are shown. B, Cumulative scores of lesion severity and angiogenesis at 14 dpi. C, Percentages and phenotype (surface TIM-3) of CD4+ T cells in the corneas of control (upper panel) and Ab-treated (lower panel) animals are shown. D, CD11b+Gr1+ polymorphonuclear neutrophils infiltrated into cornea of control (upper panel) and Ab treated (lower panel) animals are shown. E, HSV-specific CD4+ T immune response in control and anti-TIM-3 Ab-treated animals is shown at day 14. Dot plots depicting the percentages of IFN-γ+TNF-α+CD4+ T cells are shown. F, Total numbers of HSV-specific CD4+IFN-γ+ and CD4+IFN-γ+TNF-α+ T cells in spleen and DLN at day 14 are shown. At day 15, experiments were terminated and corneas were pooled and collagen digested to enumerate and phenotype the recovered cells. Additionally, lymph nodes and spleens were collected from animals with positive lesions to measure HSV-specific immune responses. As seen in Fig. 2⇑, C and D, the number of both CD4+ T cells and granulocytes was far greater in the ocular samples from anti-TIM-3-treated animals than in controls (a >10-fold increase in CD4+ T cells and granulocytes). With regard to phenotype, the frequency of CD4+ T cells that were TIM-3+ was far higher in the anti-TIM-3 mAb group (72% in one experiment) than in controls (35%). The reason for this observation was not clear, but conceivably it could have reflected the finding that the magnitude of anti-HSV CD4+ T cell responses was higher in the anti-TIM-3 mAb-treated animals (Fig. 2⇑, E and F). Thus, cells isolated from individual spleens and DLNs at 15 dpi of control Ab and TIM-3 Ab recipients, when stimulated with HSV Ags and the numbers of IFN-γ- and TNF-α-producing cells measured, revealed a 2.5-fold increase in the frequencies and numbers of each of the cytokine-producing cell populations in anti-TIM-3-treated animals (Fig. 2⇑, E and F). These results indicated that TIM-3 signaling of CD4+ T cells in lymphoid organs or perhaps corneal lesions via its ligand under natural conditions may serve to regulate the extent of SK and that this may proceed at least in part by influencing the magnitude of the immune response. Recently, galectin-9 was shown to be the natural ligand of TIM-3 and that signaling via galectin-9, at least to some T cell subsets, may cause them to undergo apoptosis (8). To evaluate if the administration of galectin-9 could influence the expression of HSK, two types of experiments were preformed in HSV ocularly infected mice. Animals were either treated i.p. with different doses of galectin-9 starting at day 4 or were given different doses of the drug injected subconjunctivally starting at day 4 or day 8 until mice were sacrificed to evaluate different parameters at day 15. Both treatment modalities inhibited SK lesions as well as the extent of neovascularization, but the efficacy of the local subconjunctival administration was the greater (Fig. 3⇓A–C). The results shown in Fig. 3⇓A demonstrated that following systemic administration, significant levels of lesion inhibition were only observed at the highest doses of galectin-9 evaluated (100 μg), but a trend for suppressed lesions was evident at lower doses. Effect of galectin-9 treatment on the severity of SK. C57BL/6 animals (n = 12) infected with 5 × 103 PFU of HSV were treated with galectin-9 (10, 50, and 100 μg) daily starting from day 4 until day 14. A, Lesion and angiogenesis scores of control and galectin-9-treated animals at day 14 are shown. B, C57BL/6 animals (n = 9) infected with 5 × 103 PFU of HSV were injected subconjuctivally with 1, 5, or 10 μg of galectin-9 daily starting from day 4 until day 13. Lesion and angiogenesis scores of control and treated animals at day 14 are shown. C, The comparative lesion scores of HSV-infected animals at 14 dpi when treated with galectin-9 either 10 μg subconjuctivally or 100 μg i.p. are shown. D, The comparative reduction in lesion severity and angiogenesis scores of HSV-infected animals treated locally with 10 μg of galectin-9 daily is shown. E, Therapeutic effect of galectin-9 (10 μg) administration on SK in C57BL/6 animals infected (n = 8) with 5 × 103 PFU of HSV. 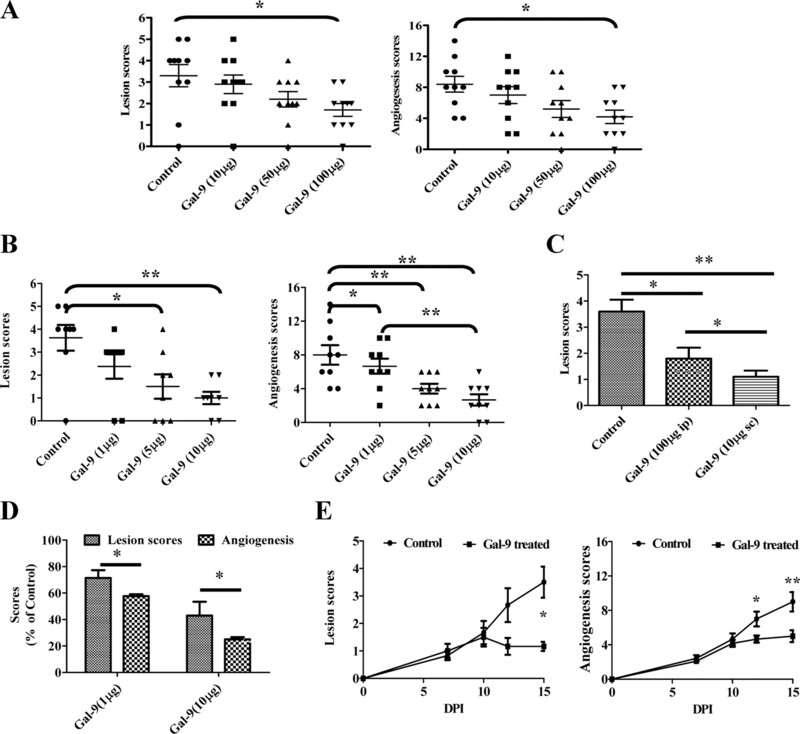 Kinetics of lesion and angiogenesis expression in control and galectin-9-treated animals (8–14 dpi) at 15 dpi are shown. All experiments were repeated at least three times. Data were analyzed using one-way ANOVA test with Dunnett’s post hoc test settings except in E, where a Student’s t test was used. With local administration of galectin-9, a dose-dependent inhibition of SK lesions and neovascularization also occurred, with the differences compared with controls even more apparent than observed with systemic administration (Fig. 3⇑, B and C). Accordingly, in animals given galectin-9 locally starting on day 4, lesions were reduced almost 3-fold on average compared with untreated controls, with these differences being highly significant (p ≥ 0.01). The numbers of CD4+TIM-3+ cells recovered from eyes were significantly reduced compared with untreated controls (Fig. 4⇓A). Additionally, the frequencies and numbers of polymorphonuclear neutrophils were reduced 6–7-fold as a consequence of galectin-9 treatment (Fig. 4⇓, B and C). Along with clinical changes occurring in response to local galectin-9 treatment, the levels of cytokines as well as the angiogenesis factor VEGF were measured in pooled corneal extracts. As shown in Fig. 4⇓D, whereas levels of the proinflammatory cytokines IL-6 and IL-12 were lower, TGF-β levels were higher than in controls. VEGF levels were also lower in galectin-9-treated pooled samples. Effects of galectin-9 treatment on cellular infiltration and cytokine levels in corneas of HSV-infected animals. C57BL/6 animals infected with 5 × 103 PFU of HSV were given 10 μg of galectin-9 subconjuctivally daily starting from day 4 until day 13 as described above in Fig. 3B. A, Total numbers of CD4+ and CD4+TIM-3+ T cells in the corneas of control and galectin-9-treated animals are shown at day 14. B and C, The frequencies and numbers of infiltrated polymorphonuclear neutrophils (CD11b+Gr1high) and a cell type akin to myeloid-derived suppressor cells (CD11b+Gr1low) are shown in control and galectin-9-treated animals. D, Levels of cytokines (IL-6, TGF-β, and IL-12) and angiokine (VEGF-A) in pooled corneal samples, each consisting of four corneas per group isolated from control and galectin-9-treated animals and as analyzed by sandwich ELISA, are shown. E, Levels of IL-6 and TGF-β in pooled corneal samples isolated from control and therapeutically treated HSV-infected animals are shown. Experiments were repeated twice. Statistical levels of significance were estimated by Student’s t test. Interestingly, if local treatment was started on day 8, the time when lesions become clinically evident, they failed to progress and even slightly diminished in severity compared with untreated animals (Fig. 3⇑E). Furthermore, as shown in Fig. 4⇑E, pooled corneal samples from treated animals had lower levels of proinflammatory (IL-6) and higher levels of antiinflammatory (TGF-β) cytokines. These data strongly indicate that TIM-3/galectin-9 interaction serves to induce resolution of viral immunoinflammatory lesions. Induction of apoptosis of TIM-3+CD4+ T cells. Prior in vitro studies have indicated that galectin-9 triggering of proinflammatory CD4+ T cells causes them to undergo apoptosis (8). Since in the HSK model, lesions appeared to be mainly orchestrated by IFN-γ-producing CD4+ T cells (6), lesions could be reduced if orchestrating T cells were destroyed. We attempted to demonstrate such an effect in vivo by examining single-cell suspensions from lymphoid organs by flow cytometry or tissue sections of treated eyes for signs of apoptotic cells. Such an effect could not be demonstrated (data not shown). However, it was evident that the total numbers of CD4+ T cells as well as HSV-specific CD4+IFN-γ+ T cells were significantly reduced in animals treated systemically with galectin-9, which could have been the consequence of apoptosis (Fig. 5⇓A). Additionally, we were able to demonstrate that CD4+ T cells that express TIM-3 as a consequence of HSV infection in vivo could be induced to undergo apoptosis when exposed to galectin-9 in vitro (Fig. 5⇓B–D). Differential effects of galectin-9 therapy on Tregs and effector CD4+ T cells in HSV-infected animals. A, Total numbers of CD4+ T cells and CD4+IFN-γ+ T cells in the DLNs and spleens of control and galectin-9 treated (systemic) animals are shown. 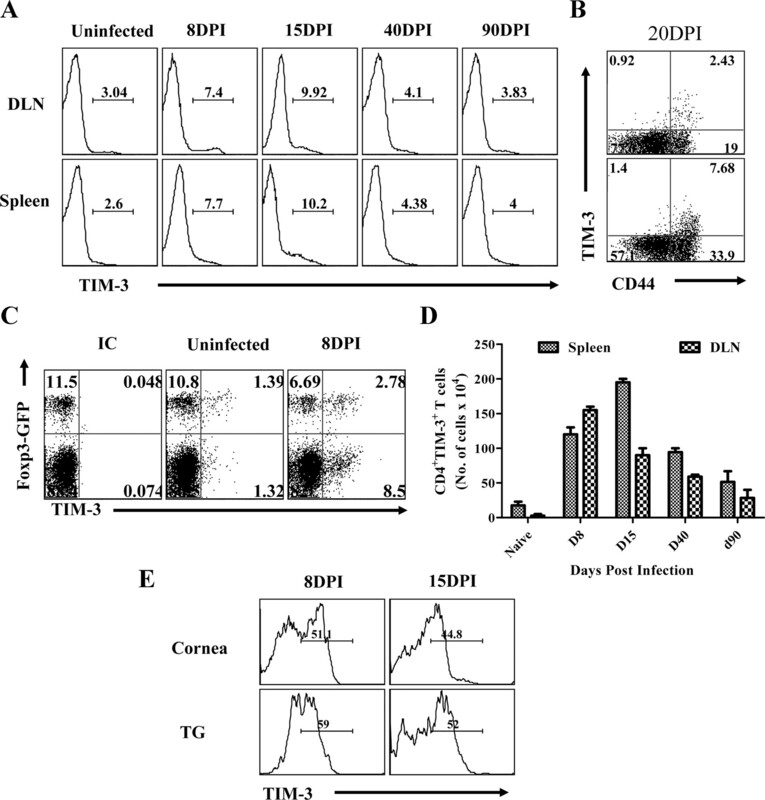 B–D, Induction of apoptosis of CD4+Foxp3−TIM-3+ T cells by galectin-9. Cells isolated from cervical lymph nodes of HSV-infected Foxp3-GFP knockin animals (day 8) and uninfected animals were cultured in the presence of PBS, galectin-3, and galectin-9 for 8 h and thereafter stained for annexin V. B, Annexin V+CD4+Foxp3− and Foxp3+ T cells isolated from infected (upper panel) and uninfected (lower panel) animals incubated with PBS and galectin-9 animals are shown. C, Bar diagram showing the percentages of annexin V+ cells under indicated conditions is shown. D, Costaining of CD4+ T cells for annexin V and TIM-3 is shown, 0.5 μM galectin-9 (upper panel) and 0.0 μM galectin-9 (lower panel). E–G, Proliferative responses of Foxp3− and Foxp3+ CD4+ T cells in HSV-infected animals after galectin-9 therapy. Frequencies (E) and absolute numbers (F) of CD4+Foxp3+ T cells in the spleens (E and F) and DLNs (F) of control and galectin-9-treated animals are shown. G, DLN cells isolated from control and galectin-9-treated animals were labeled with CFSE and their proliferative responses in the presence of anti-CD3 and anti-CD28 were analyzed after 3 days. CD4+-gated populations analyzed for the dilution of CFSE in Foxp3+ and Foxp3− CD4+ T cells from control (thin line) and galectin-9 treated (thick line) animals are shown. As TIM-3 expression was also evident on ∼10–15% of Foxp3+CD4+ T cells in lymphoid organs, we investigated if these cells are also susceptible to killing by galectin-9 ligation. Thus, DLN cells were isolated from either infected or uninfected GFP-Foxp3 knockin animals and treated with various doses of galectin-9 in vitro for 8 h. As shown in Fig. 5⇑B, while >90% of CD4+TIM-3+Foxp3− cells underwent apoptosis, <10% of CD4+TIM-3+Foxp3+ T cells were annexin V+. Furthermore, CD4+TIM-3+Foxp3+ T cells showed minimal levels of expression of annexin V on their surface as measured by the mean fluorescence intensity. This could mean that as a consequence of galectin-9 treatment with Foxp3+ cells showing more resistance to apoptosis, the Treg-to-effector T cell ratio would increase, perhaps accounting in part for the antiinflammatory effect of galectin-9. Expansion or induction of Foxp3+ Tregs. Prior experiments have established that the severity of HSK lesions can be modulated by Foxp3+ Tregs either induced in vivo or by adoptive transfers of such cells (15, 17). There is some indirect evidence that galectin-9 could be involved in the induction of Foxp3+ cells since such cells were reduced in numbers in galectin-9 knockout animals (12). To determine whether galectin-9 administration to HSV-infected animals had any influence on the Treg response, experiments were done in which animals were infected with HSV, after which from day 4 to day 14 one group was injected systemically with a dose of galectin-9 shown to be effective at diminishing lesion severity, and the other group received diluent. Experiments were terminated on day 15, and the cell types in individual DLN and spleen were collected to quantify CD4+ T cells that were Foxp3+. As shown in Fig. 5⇑, E and F, significant increases (p ≥ 0.05) in the frequencies and numbers of CD4+Foxp3+ T cells were evident in the spleens of galectin-9-treated animals. Additionally, the numbers of Foxp3+ cells in the DLNs of galectin-9-treated animals were also increased, but the numbers compared with controls were not significant. This effect of galectin-9 treatment might be the consequence of expansion of preexisting Foxp3+ cells or perhaps conversion of some Foxp3− cells to become Foxp3+. Evidence that galectin-9 could be causing some expansion of Foxp3+ cells was shown by comparing the proliferative capacity in vitro of Foxp3+ cells from control and galectin-9-treated animals. As shown in Fig. 5⇑G, CFSE dilution in Foxp3+ cells TCR stimulated for 3 days in the presence of IL-2 was greater in the cell population from galectin-9-treated animals than from controls. Curiously, the effect of galectin-9 treatment on the response of Foxp3− cells was to diminish their proliferation capacity compared with that occurring in the same cell population from controls. These observations support the concept that the enrichment of Foxp3+ cells in galectin-9-treated animals could in part be explained by expansion of previously Foxp3+ cells. However, the relative contribution of increased proliferative response of Foxp3+ and decreased proliferative response of Foxp3−CD4+ T cells could not be established in these studies. 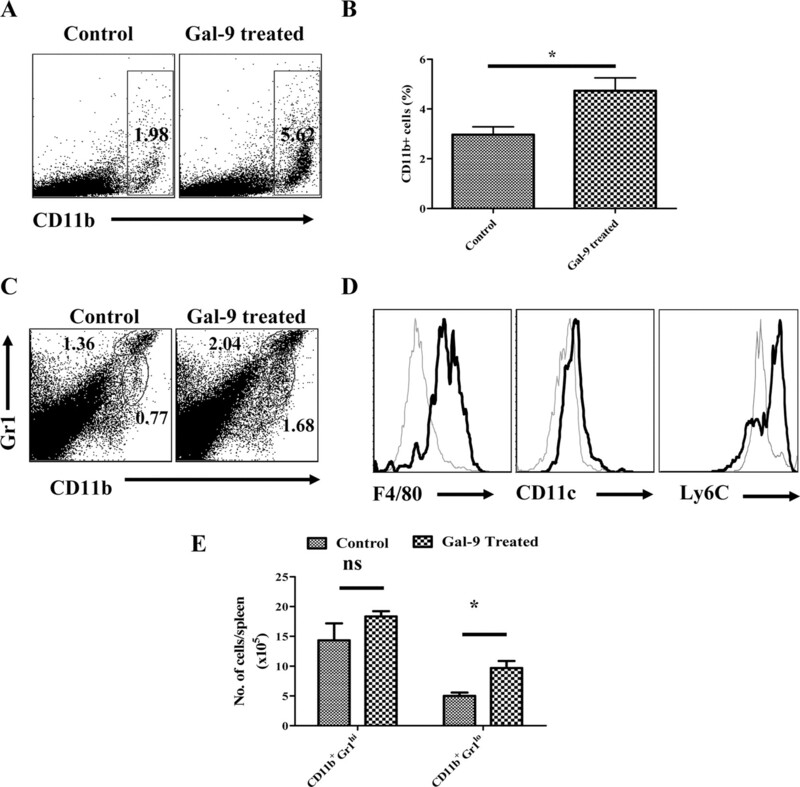 Galectin-9 may promote Foxp3+ Treg conversion and limit Th17 generation in vitro. To directly assess whether galectin-9 can cause some TCR-stimulated conventional T cells to become Foxp3+, an in vitro culture system was used that in previous studies demonstrated Foxp3+ conversion (17). Briefly, splenocytes from DO11.10 RAG−/− animals (that lack Tregs) were stimulated in vitro with plate-bound anti-CD3 Ab, optimal amounts of IL-2, and various doses of galectin-9. TGF-β at optimal amounts was used instead of galectin-9 as a positive control system for Foxp3+ Treg induction. In such experiments galectin-9 did cause significant numbers of cells to convert to become Foxp3+, although the conversion was around 4- to 5-fold less effective than occurred with TGF-β (Fig. 6⇓, A and B). When experiments were done using suboptimal amounts of TGF-β, the addition of galectin-9 increased the conversion beyond the various doses of galectin-9 in the absence of TGF-β. This observation may mean that galectin-9 might be inducing TGF-β in the cultures, which in turn could enhance the conversion efficiency, although this needs to be formally confirmed. Effects of galectin-9 treatment on the generation of CD4+Foxp3+ Tregs and Th17 cells in vitro. Splenocytes isolated from DO11.10 RAG2−/− animals were cultured with IL-2 alone, IL-2 plus TGF-β (2 ng/ml), IL-2 plus galectin-9, IL-2 plus TGF-β plus galectin-9, or IL-2 plus TGF-β plus IL-6 with or without galectin-9. 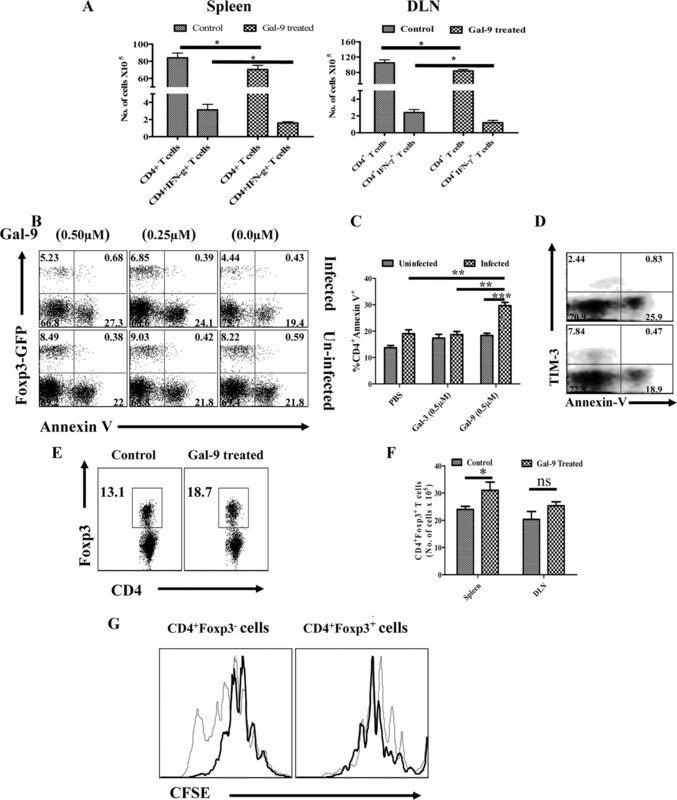 A, Representative FACS plots from more than six experiments showing the Foxp3 induction in TCR-stimulated CD4+ T cells isolated from DO11.10 RAG2−/− animals under indicated conditions. B, The bar diagram shows the percentage of CD4+ T cells expressing Foxp3 under indicated conditions. The levels of significance were calculated by an ANOVA test. C, Cells were cultured under Th17 differentiating conditions (IL-2 (50U/ml) + TGF-β (10 ng/ml) + IL-6 (30 ng/ml)) with or without galectin-9. The dot plots show the inhibitory effects on the generation of Th17 cells (upper panel) and the stimulatory effects on the generation of Foxp3+ T cells (lower panel) of various doses of galectin-9 in in vitro cultures. D, The bar diagram shows the percentages of Th17 or Foxp3+ Tregs induced under indicated conditions. The experiments were repeated at least four times and the level of significance was determined by a Student’s t test. In another approach splenocytes from DO11.10 RAG−/− animals were cultured in conditions that resulted in the induction of Th17 cells. Basically such cultures were OVA323–339-stimulated whole splenocytes in the presence of IL-2, TGF-β, and IL-6. Curiously, the addition of galectin-9 in these cultures inhibited the induction of Th17 cells in a dose-dependent manner (Fig. 6⇑, C and D). Of particular interest, the addition of galectin-9 in these cultures increased the production of Foxp3+ cells up to 4-fold. The results could mean, however, that the antiinflammatory effects of galectin-9 will not be negated by the presence of proinflammatroy cytokines such as IL-6 in the inflamed tissue. We did not investigate the mechanism of Th17 suppression, but conceivably it could involve galectin-9 apoptosis signals delivered to TIM-3 expressed by developing Th17 cells. We are currently attempting to verify this. Expansion of myeloid suppressor cells. Interestingly, galectin-9-treated animals, as compared with control animals, showed significantly expanded populations of CD11b+ cells, especially in the spleens (Fig. 7⇓, A and B). As shown in Fig. 7⇓, C–E, a significant proportion of these cells also expressed Gr1low, F4/80+, and Ly6Chigh, a phenotype possessed by myeloid suppressor cells, which have been shown to inhibit the function of conventional CD4+ and CD8+ T cells (20, 21). Interestingly, the frequencies of cells of this phenotype also increased when galectin-9 treatment was performed locally in the corneas of infected animals (Fig. 4⇑, B and C). Future studies will attempt to measure if the myeloid suppressor cells play any regulatory effect in HSK. 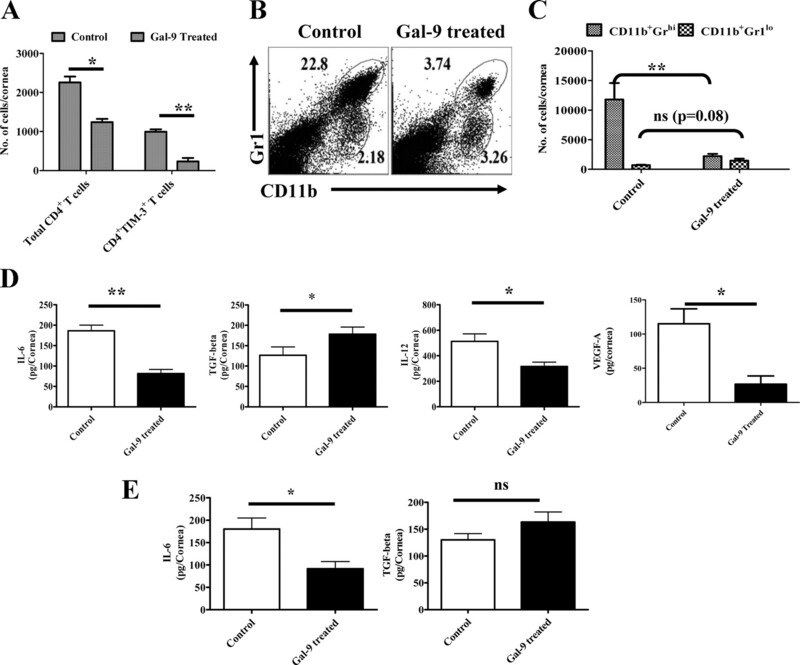 Effects of galectin-9 administration on CD11b+ myeloid suppressor cells. C57BL/6 animals infected with 5 × 103 PFU of HSV were treated i.p. with 100 μg of galectin-9 daily starting from day 4 until day 14 as described in Fig. 3A and CD11b+ cells from control and galectin-9-treated animals were phenotypically characterized at day 15 postinfection. A and B, FACS plots (A) and bar diagram (B) depicting the percentages of CD11b+ cells in the spleens of control and galectin-9-treated animals at day 14 are shown. C and D, Phenotypic characterization of CD11b+ cells from control and galectin-9-treated animals with respect to the expression of Gr1, F4/80, CD11c, and Ly6C is shown. C, Bold lines in histograms in D show the expression of the indicated marker on CD11b+Gr1low gated population, while thin lines show the expression of indicated surface molecules on CD11b+Gr1high gated population from the spleens of galectin-9-treated animals. E, Total numbers of cells in gated CD11b+Gr1high and CD11b+Gr1low cells in the spleens of control and galectin-9 treated animals as shown in C. A Student’s t test was used to calculate significance level between groups. Taken together, our results may indicate that a consequence of galectin-9 therapy is that there is an overall increase in the frequency of regulatory cells that include both Foxp3+ Tregs and CD11b+Gr1lowF4/80+Ly6Chigh myeloid suppressor cells. Expanded populations of Foxp3+ Tregs may represent conversion of conventional cells to become Tregs and perhaps reflect a disappearance of CD4+ Th1 cells because many TIM-3+ cells are triggered to die by apoptosis. As indicated above, galectin-9 treatment of HSV-infected mice also led to a reduction in the extent of ocular neovascularization. Indeed, there was a trend for the effect on this necessary step in HSK pathogenesis to be greater than was observed on SK lesion severity (Fig. 3⇑D). This effect could be explained by the fact that some angiogenic factors derive from the inflammatory cells themselves, and these responses were reduced in galectin-9-treated animals. Alternatively, galectin-9 might have some direct inhibitory effects on cells in the eye that produce angiogenesis factors in response to infection. To mimic the latter possibility, the effects of galectin-9 on the induced production of VEGF-A mRNA in stromal fibroblast cell line was measured. These cells can be induced to produce the angiogenic factor VEGF-A upon exposure to IL-6 or HSV infection (22). Experiments were performed in which MK/T-1 cells were exposed to a high multiplicity of HSV-KOS (5 MOI), which resulted in cells up-regulating VEGF-A mRNA. This increase, which reached 1800-fold in some instance, was suppressed up to 100-fold by galectin-9 (Fig. 8⇓). Similar doses of galectin-3 were almost without inhibitory effects. These results support the possibility that galectin-9 can function as an angiogenesis factor inhibitor, although it must mediate its function by binding to a receptor distinct from TIM-3 since the latter molecule was not detectable on the MK/T-1 cells (data not shown). Effects of galectin-9 on VEGF-A production. MK/T-1 (stromal fibroblast cell line) cells were used to observe the effect of galecetin-9 on VEGF production. The cells were infected with 5 MOI of HSV-KOS and were then treated with various doses of galectin-9. VEGF-A mRNA expression was measured at 6 and 12 h from control and galectin-9 (1, 10, and 50 μg/ml)-treated cells as normalized with HPRT expression is shown. One-way ANOVA was used to calculate the level of significance. Controlling chronic immunoinflammatory diseases represents a major therapeutic challenge. Such an example is lesions in the eye caused by HSV infection, which commonly result in blindness. These lesions are strongly suspected to result from T cell-mediated responses to the infection. Since the main T cell subset responsible for orchestrating lesions of SK appear to be CD4+ T cells of Th1 type with perhaps some involvement by Th17 CD4+ T cells, a logical approach to therapy would be to suppress or delete the function of activated CD4+ T cell subsets and increase the representation of cells that express regulatory function. We show herein that this outcome can be achieved by therapy, systemic or local, with the lectin family member galectin-9. This molecule, which is a natural product of cell types, such as several cells of innate immune system, endothelial cells, and epithelial cells, acts as a ligand to the inhibitory molecule TIM-3 that is expressed by activated but not naive T cells. We show that 50% or more of T cells in ocular lesions caused by HSV in mice express TIM-3 and that blocking signals from its natural ligand with a mAb results in more severe lesions. More importantly, however, the provision of additional galectin-9 either systemically or more effectively by local subconjuctival administration diminished SK lesion severity as well as the extent of corneal neovascularization. The mechanisms by which the galectin-9 therapy functioned were shown to be multiple. These involved apoptosis of the orchestrating effector T cells with consequent reduction of proinflammatory cytokines, an increase in the representation of two separate subtypes of regulatory cells, as well as inhibitory effects on the production of molecules involved in ocular neovascularization, an essential component of HSK pathogenesis. Our results indicate that galectin-9 therapy may represent a useful approach to control HSV-induced lesions, the most common infectious cause of blindness in the Western world. A number of previous reports have shown that activated T cells, both CD4+ and CD8+ T cells (8, 13), may up-regulate TIM-3 and that the engagement of the receptor with its ligand galectin-9 causes cells to undergo apoptosis (23). Currently, TIM-3 was also shown to be one of many molecules up-regulated on T cells that are chronically stimulated during HIV infection (24). Since galectin-9 is a product of several cell types with its production increased upon exposure to some cytokines released from activated T cells, the TIM-3/galectin-9 interaction may represent a physiological means by which effector T cell responses are terminated (8, 11). Thus, the severity of some autoimmune inflammatory responses may be more severe in galectin-9 knockout animals (12). Also of therapeutic relevance, it has been observed that administration of galectin-9 may suppress the severity of some autoimmunities even when given quite late in the disease process (12). Our studies as well, in which we investigate the relevance of TIM-3/galectin-9 in a chronic viral induced inflammatory disease, show that galectin-9 administration caused the suppression of HSK lesions even when the drug was given 8 days after virus infection. At this stage, virus is usually no longer present in the eye, although without treatment lesions continue to advance in severity and usually do not resolve spontaneously (25). In some instances we observed that galectin-9 therapy did cause almost complete resolution. We presume that the efficacy of galectin-9 therapy could have resulted from causing apoptosis of the CD4+ T cells responsible for orchestrating lesions. However, we failed to show any evidence of T cell apoptosis in vivo, which may not be too surprising since apoptotic cells are rapidly phagocytosed in vivo (26, 27). We could readily show apoptosis of TIM-3+ cells in populations of lymphoid cells taken from HSV-infected animals when exposed to galectin-9 in vitro. However, in such experiments, many TIM-3+ cells resisted apoptosis even at the highest doses of galectin-9 investigated. Curiously, in our in vitro studies we observed that TIM-3+Foxp3+CD4+ T cells showed more resistance to galectin-9-induced apoptosis than did Foxp3−CD4+TIM-3+ T cells. The molecular explanation for this interesting observation is currently under further investigation. However, if it turns out that Foxp3+ Tregs are more resistant to galectin-9-induced apoptosis in vivo, this might explain why the treatment resulted in suppressed SK lesions. Thus, as we have shown previously, the Treg response serves to modulate the severity of SK lesions (18). Differential susceptibility of T effectors to Tregs would result in Treg enrichment. In line with this, we did observe that frequencies of Foxp3+ T cells in lymphoid tissues as well as ocular inflammatory populations were increased in galectin-9-treated infected animals. That galectin-9 administration may result in the apparent induction of Foxp3+ Tregs was also reported recently by Seki et al., although the mechanisms responsible for the effect were not investigated (12). In our studies, we observed that galectin-9 could affect the Treg responses by mediating at least two effects in addition to the differential susceptibility to apoptosis. Accordingly, we could show that the proliferative capacity in vitro of TCR-stimulated Foxp3 cells was greater in populations taken from galectin-9-treated compared with control animals. However, perhaps of more importance, we could also demonstrate that galectin-9 was able to induce conventional naive TCR-stimulated CD4+ T cells to convert to become Foxp3+. This was shown using TCR transgenic T cells TCR stimulated in vitro in the presence of galectin-9. Significant levels of conversion were observed, although this was less than what could be achieved with optimal doses of TGF-β. In fact, our results could mean that the galectin-9 conversion effect involved the production of TGF-β, since when cells were stimulated in the presence of suboptimal levels of TGF-β, galectin-9 addition caused higher levels of conversion than could be achieved with galectin-9 or TGF-β alone. However, at present other possibilities cannot be ruled out. Whether galectin-9 administration succeeds in converting conventional cells to become Foxp3+ and their expansion in vivo is currently under investigation. If it does occur, it might help explain why some parasitic infections appear to be potent inducers of Treg responses, which in turn play an important role during pathogenesis (28, 29). Thus, many parasites express high levels of lectins that include galectin-9 in their surface components (29). Furthermore, galectin-9 is expressed abundantly in the gut mucosa (30), which is a site where the peripheral generation of Tregs readily occurs (31, 32, 33). The presence of galectin-9 may help counteract an inflammatory environment that favors the induction of Th17 cells, as we were able to demonstrate in our in vitro studies. Whereas previous reports have noted that the TIM-3/galectin-9 interaction can have a notable effect on inflammatory cell function, any effect on angiogenesis was not noted. In our study, we observed that galectin-9 administration had an even greater effect on angiogenesis than it did on the severity of the SK lesions. The reasons for this may be that galectin-9 may be inhibiting the production of angiogenesis factors such as VEGF responsible for causing the new blood vessel development that plays an essential part of SK pathogenesis. Exactly how galectin-9 causes its inhibitory effects on angiogenesis factor induction still requires further investigation. Of particular interest in our model systems, we demonstrated an inhibitory effect of galectin-9 on the induced production of VEGF from cells that lacked demonstrable TIM-3. Taken together, our results are consistent with the observation that the TIM-3/galectin-9 interaction plays a critical role in influencing the expression of HSV-induced ocular lesions. It seems likely that the interaction affects lesion severity under normal circumstances since lesions become more severe if signals from endogenous galectin-9 are blocked with anti-TIM-3 mAb. Moreover, the interaction can be exploited for therapeutic purposes since treatment with galectin-9 can diminish lesions and can even result in their resolution. The mechanisms by which therapy succeeds are multiple and involve a change in balance between proinflammatory effector cells and regulators as well as effects on the production of angiogenesis factors responsible for causing neovascularization of the eye. It remains a challenge to sort out the relative importance in vivo that the several beneficial effects that galectin-9 mediates against viral immunoinflammatory lesions. We thank Nancy Neilsen for excellent technical support with flow cytometry. We also thank Naveen Rajasagi and Stacy Grimshaw for invaluable assistance in many ways. ↵1 This work was supported by National Institute of Allergy and Infectious Diseases Grant AI 063365 and National Institutes of Health Grant EY 05093. ↵3 Abbreviations used in this paper: HSK, herpetic stromal keratitis; DLN, draining lymph node; dpi, days postinfection; HPRT, hypoxanthine phosphoribosyltransferase; MOI, multiplicity of infection; SK, stromal keratitis; TIM-3, T cell Ig and mucin-3; Treg, regulatory T cell; VEGF, vascular endothelial growth factor. Kim, B., S. D. Kaistha, B. T. Rouse. 2006. Viruses and autoimmunity. Autoimmunity 39: 71-77. Zhao, Z. S., F. Granucci, L. Yeh, P. A. Schaffer, H. Cantor. 1998. Molecular mimicry by herpes simplex virus-type 1: autoimmune disease after viral infection. Science 279: 1344-1347. Weinstein, B. I., J. Schwartz, G. G. Gordon, M. O. Dominguez, S. Varma, M. W. Dunn, A. L. Southren. 1982. Characterization of a glucocorticoid receptor and the direct effect of dexamethasone on herpes simplex virus infection of rabbit corneal cells in culture. Invest. Ophthalmol. Vis. Sci. 23: 651-659. Deshpande, S. P., M. Zheng, S. Lee, B. T. Rouse. 2002. Mechanisms of pathogenesis in herpetic immunoinflammatory ocular lesions. Vet. Microbiol. 86: 17-26. Niemialtowski, M. G., B. T. Rouse. 1992. Phenotypic and functional studies on ocular T cells during herpetic infections of the eye. J. Immunol. 148: 1864-1870. Niemialtowski, M. G., B. T. Rouse. 1992. Predominance of Th1 cells in ocular tissues during herpetic stromal keratitis. J. Immunol. 149: 3035-3039. Kuchroo, V. K., V. Dardalhon, S. Xiao, A. C. Anderson. 2008. New roles for TIM family members in immune regulation. Nat. Rev. Immunol. 8: 577-580. Anderson, D. E.. 2007. TIM-3 as a therapeutic target in human inflammatory diseases. Expert Opin. Ther. Targets 11: 1005-1009. Seki, M., S. Oomizu, K. M. Sakata, A. Sakata, T. Arikawa, K. Watanabe, K. Ito, K. Takeshita, T. Niki, N. Saita, et al 2008. Galectin-9 suppresses the generation of Th17, promotes the induction of regulatory T cells, and regulates experimental autoimmune arthritis. Clin. Immunol. 127: 78-88. Wang, F., W. He, H. Zhou, J. Yuan, K. Wu, L. Xu, Z. K. Chen. 2007. The Tim-3 ligand galectin-9 negatively regulates CD8+ alloreactive T cell and prolongs survival of skin graft. Cell. Immunol. 250: 68-74. Wang, F., W. He, J. Yuan, K. Wu, H. Zhou, W. Zhang, Z. K. Chen. 2008. Activation of Tim-3-galectin-9 pathway improves survival of fully allogeneic skin grafts. Transplant Immunol. 19: 12-19. Sehrawat, S., B. T. Rouse. 2008. Anti-inflammatory effects of FTY720 against viral-induced immunopathology: role of drug-induced conversion of T cells to become Foxp3+ regulators. J. Immunol. 180: 7636-7647. Kim, B., Q. Tang, P. S. Biswas, J. Xu, R. M. Schiffelers, F. Y. Xie, A. M. Ansari, P. V. Scaria, M. C. Woodle, P. Lu, B. T. Rouse. 2004. Inhibition of ocular angiogenesis by siRNA targeting vascular endothelial growth factor pathway genes: therapeutic strategy for herpetic stromal keratitis. Am. J. Pathol. 165: 2177-2185. Sehrawat, S., S. Suvas, P. P. Sarangi, A. Suryawanshi, B. T. Rouse. 2008. In vitro-generated antigen-specific CD4+CD25+Foxp3+ regulatory T cells control the severity of herpes simplex virus-induced ocular immunoinflammatory lesions. J. Virol. 82: 6838-6851. Monney, L., C. A. Sabatos, J. L. Gaglia, A. Ryu, H. Waldner, T. Chernova, S. Manning, E. A. Greenfield, A. J. Coyle, R. A. Sobel, et al 2002. Th1-specific cell surface protein Tim-3 regulates macrophage activation and severity of an autoimmune disease. Nature 415: 536-541. Zhu, B., Y. Bando, S. Xiao, K. Yang, A. C. Anderson, V. K. Kuchroo, S. J. Khoury. 2007. CD11b+Ly-6Chi suppressive monocytes in experimental autoimmune encephalomyelitis. J. Immunol. 179: 5228-5237. Gallina, G., L. Dolcetti, P. Serafini, C. De Santo, I. Marigo, M. P. Colombo, G. Basso, F. Brombacher, I. Borrello, P. Zanovello, et al 2006. Tumors induce a subset of inflammatory monocytes with immunosuppressive activity on CD8+ T cells. J. Clin. Invest. 116: 2777-2790. Zheng, M., D. M. Klinman, M. Gierynska, B. T. Rouse. 2002. DNA containing CpG motifs induces angiogenesis. Proc. Natl. Acad. Sci. USA 99: 8944-8949. Kashio, Y., K. Nakamura, M. J. Abedin, M. Seki, N. Nishi, N. Yoshida, T. Nakamura, M. Hirashima. 2003. Galectin-9 induces apoptosis through the calcium-calpain-caspase-1 pathway. J. Immunol. 170: 3631-3636. Jones, R. B., L. C. Ndhlovu, J. D. Barbour, P. M. Sheth, A. R. Jha, B. R. Long, J. C. Wong, M. Satkunarajah, M. Schweneker, J. M. Chapman, et al 2008. Tim-3 expression defines a novel population of dysfunctional T cells with highly elevated frequencies in progressive HIV-1 infection. J. Exp. Med. 205: 2763-2779. Rouse, B. T., P. S. Sarangi. 2009. Herpetic Keratitis Elsevier, London, U.K.
Savill, J., V. Fadok, P. Henson, C. Haslett. 1993. Phagocyte recognition of cells undergoing apoptosis. Immunol. Today 14: 131-136. Pelletier, I., T. Hashidate, T. Urashima, N. Nishi, T. Nakamura, M. Futai, Y. Arata, K. Kasai, M. Hirashima, J. Hirabayashi, S. Sato. 2003. 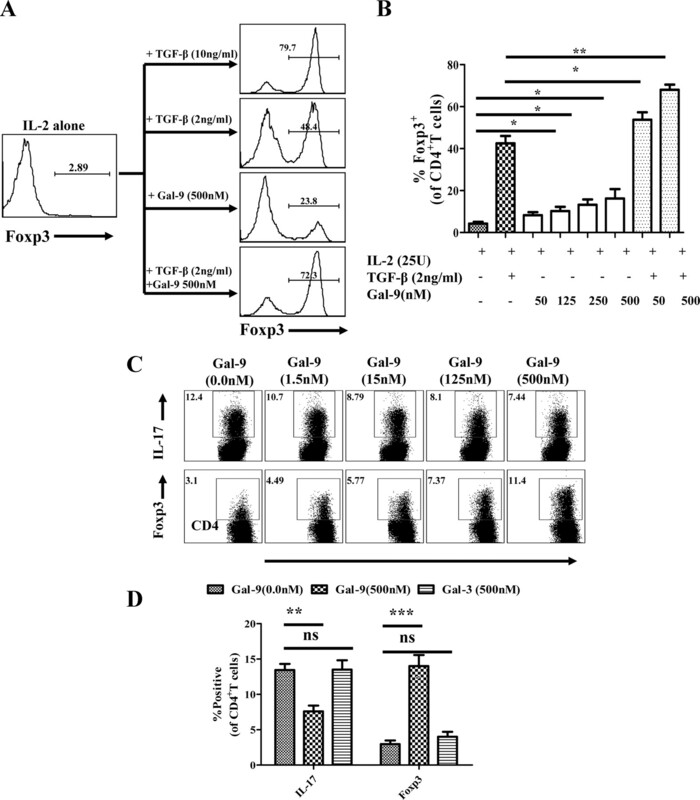 Specific recognition of Leishmania major poly-β-galactosyl epitopes by galectin-9: possible implication of galectin-9 in interaction between L. major and host cells. J. Biol. Chem. 278: 22223-22230. Turco, S. J., A. Descoteaux. 1992. The lipophosphoglycan of Leishmania parasites. Annu. Rev. Microbiol. 46: 65-94. Wada, J., Y. S. Kanwar. 1997. Identification and characterization of galectin-9, a novel β-galactoside-binding mammalian lectin. J. Biol. Chem. 272: 6078-6086. Sun, C. M., J. A. Hall, R. B. Blank, N. Bouladoux, M. Oukka, J. R. Mora, Y. Belkaid. 2007. Small intestine lamina propria dendritic cells promote de novo generation of Foxp3 Treg cells via retinoic acid. J. Exp. Med. 204: 1775-1785. Coombes, J. L., K. R. Siddiqui, C. V. Arancibia-Carcamo, J. Hall, C. M. Sun, Y. Belkaid, F. Powrie. 2007. A functionally specialized population of mucosal CD103+ DCs induces Foxp3+ regulatory T cells via a TGF-β and retinoic acid-dependent mechanism. J. Exp. Med. 204: 1757-1764.
von Boehmer, H.. 2007. Oral tolerance: is it all retinoic acid?. J. Exp. Med. 204: 1737-1739.